After going about 2000 miles round trip I am glad to be home. It is always so hard to figure out how to entertain children while on a road trip as well as teach them something. As a homeschool family we have to take every thing we do and make it educational. I believe the highlight of the trip was for the kids to see cotton growing. It is not something that ever really come up about where it comes from. We have watched sheep get sheered and maybe they just thought cotton was the same as wool. They were very interested in the fact that something we make clothes out of comes from the ground. Pretty sure the 6 year old had a vision of a shirt growing out of the ground when we started to talk about it. It was a nice thing to pass by and be able to not only tell a bit of history but to also learn about clothes being made. They also now see that many resources come from the ground and not just food. Now no trip to the south is complete without a trip to the beach! We now have a project to learn about now that we are back home and can do some research. 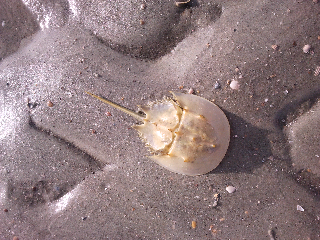 While on the beach we found a dead horseshoe crab. His shell was all yellow and clear. Now we have found one alive before and they are a very dark color. So our.question is what makes them dark when their shell is see through? Well that is some trip. Sounds avdenterous! Your comment about seeing cotton grow made me chuckle. Our town has a big cotton gin and we have cotton all around us. Several months of the year, we drive down the road and there is cotton littering the sides of the streets.